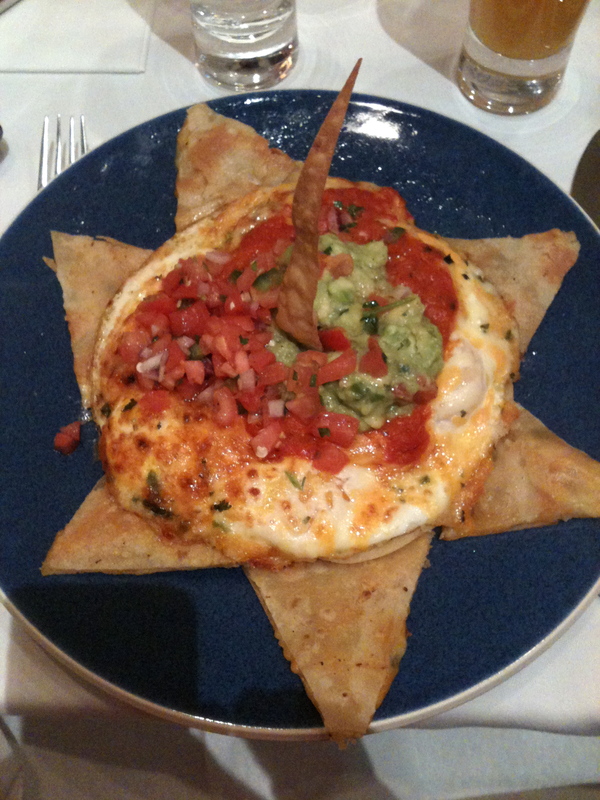 Kind of like Julie & Julia… get it? Yesterday, I was honored to be the guest of Carson-Newman College’s family and consumer sciences dean, Dr. Kitty Coffey. She and her faculty arranged an event in which their nutrition and dietetics students prepared recipes from my cookbooks and served them to a group of faculty and guests. Later, I spoke to a group that included the Student Dietetics club, as well as faculty and students, followed by a book signing. 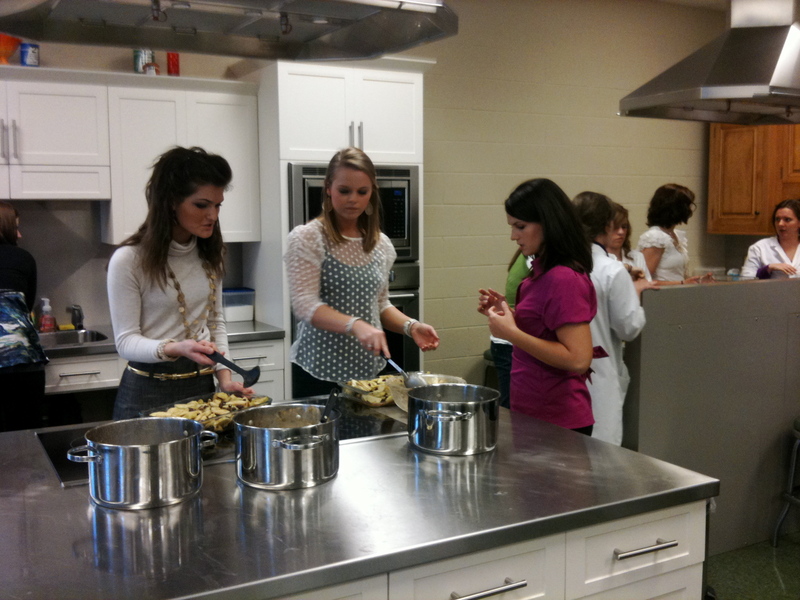 Carson-Newman students prepare apple crisp from Atlanta Classic Desserts. 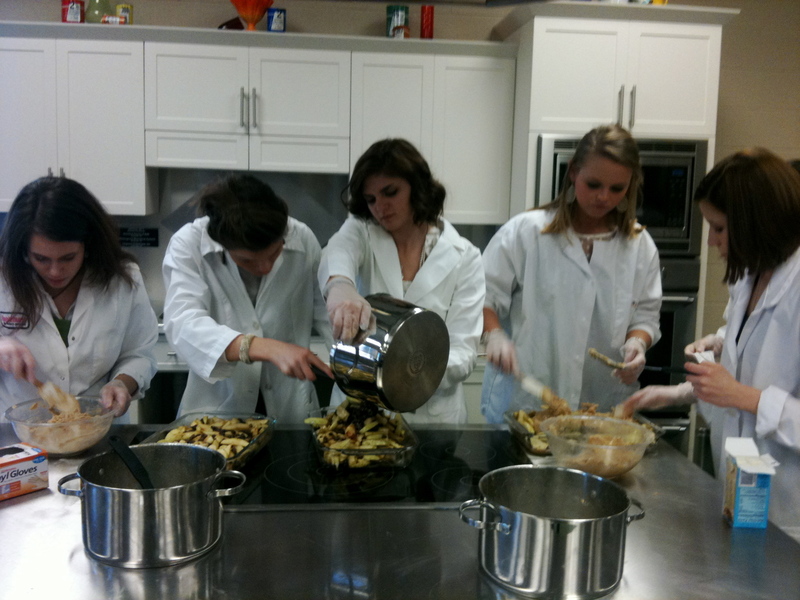 Students working in C-N's test kitchens. If you’re my age, you remember when classes like these were called “home ec.” Under Dr. Coffey’s direction, her students are exposed to professionals in their fields, from interior design to food writing. She says she wants to show them they have career options apart from health care and institutional work. In addition, she teamed with former CN adjunct Dr. Beverly Hammond, now an engineer and designer at Thermador’s factory in nearby La Follette, Tenn., to equip her department’s building with an astonishing array of Thermador professional stoves, Bosch dishwashers and refrigerators — a donation valued at about $250,000. These kitchens — with beautiful cabinetry and countertops donated by Knoxville cabinetmakers — would make Martha Stewart salivate. Carson-Newman’s food lab and test kitchens (they also evaluated stoves and ranges for Thermador before they go on the market) are the only such beneficiaries of Thermador’s largesse in North America. A word here about Dr. Coffey, a woman I deeply admire. She is the best kind of powerful Southern matriarch — her love for the students, and theirs for her, is palpable. Petite, stylish and well-mannered as I am gangly and blunt, she has garnered influence and recognition for her own work, but always uses it to her students’ greatest benefit. When we met her before the event, she was red-eyed after reading an student’s moving essay. By the time we sat down to dinner at the beautifully set table, with Dr. Coffey at one end of the table, Dr. Hammond at the other, my art professor husband nearby (placed by strict etiquette rules apart from me) and students between us, the event had the feel of a real dinner party, from the students’ pearls and chic clothes to the yarns we all told. After the students served us, they sat rapt through my short, and somewhat rambly talk, before asking several smart questions. They seemed pleased with the event overall, but couldn’t possibly have enjoyed it as much as I did. 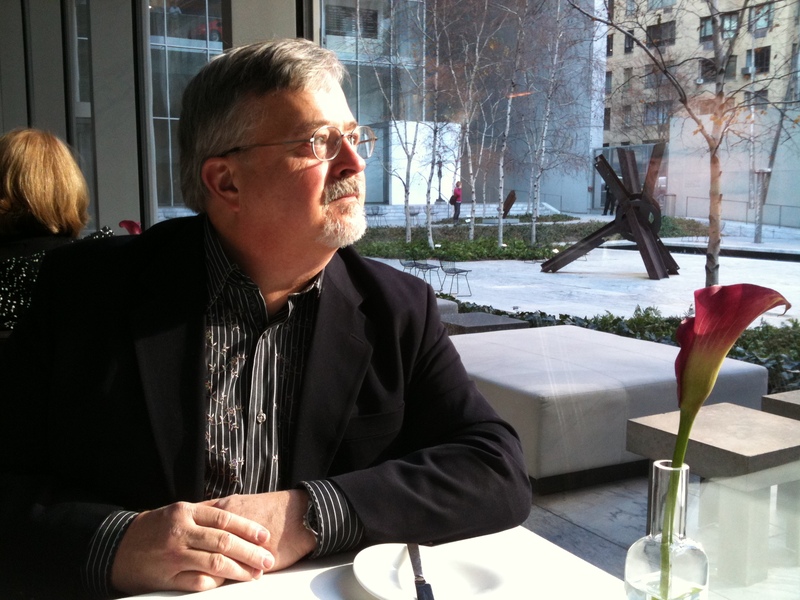 If any of you read this, and you ever need restaurant recommendations in Atlanta, please send me an email and I will make some suggestions for you. You students have some important work ahead of you — educating and feeding America as it begins to unlearn decades of unhealthy, unsustainable practices. I’m excited that these talented, capable, passionate students will be working toward changing our foodways for the better. 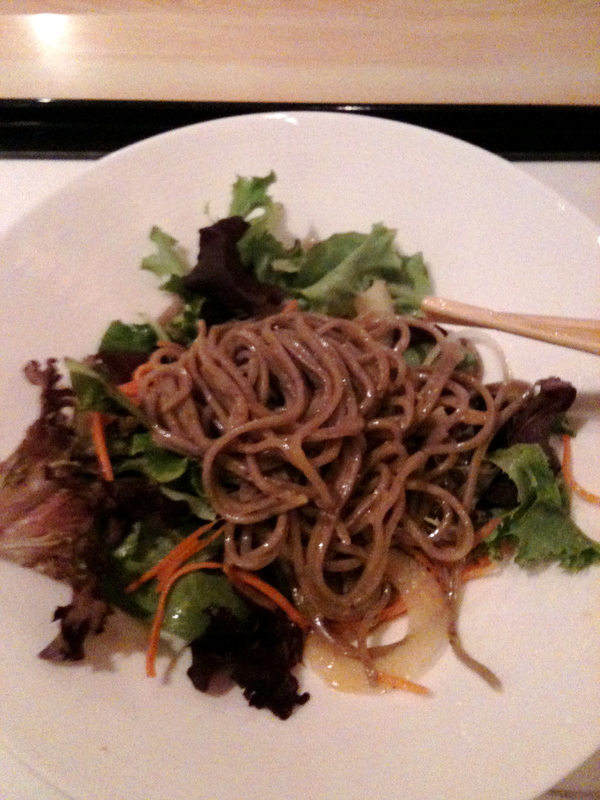 Soba noodles, at Restaurant Nippon. 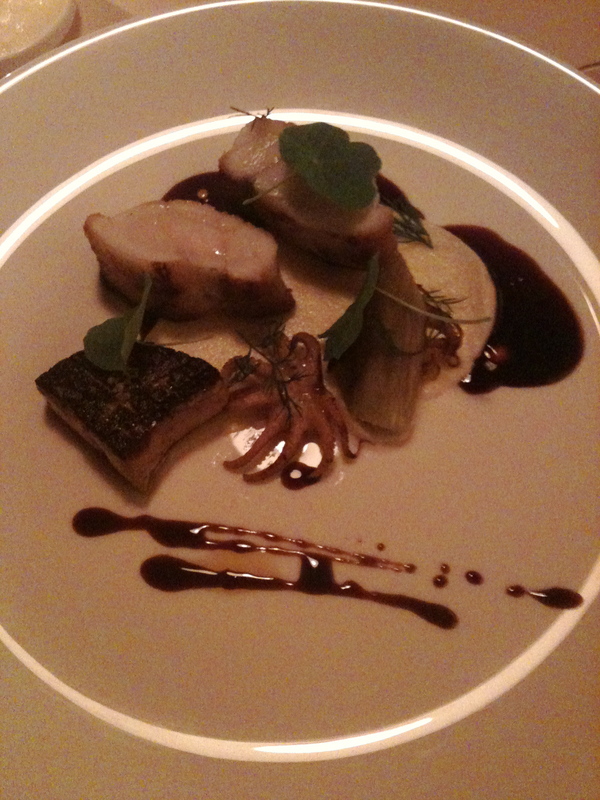 Monkfish and calamari, at Aquavit. 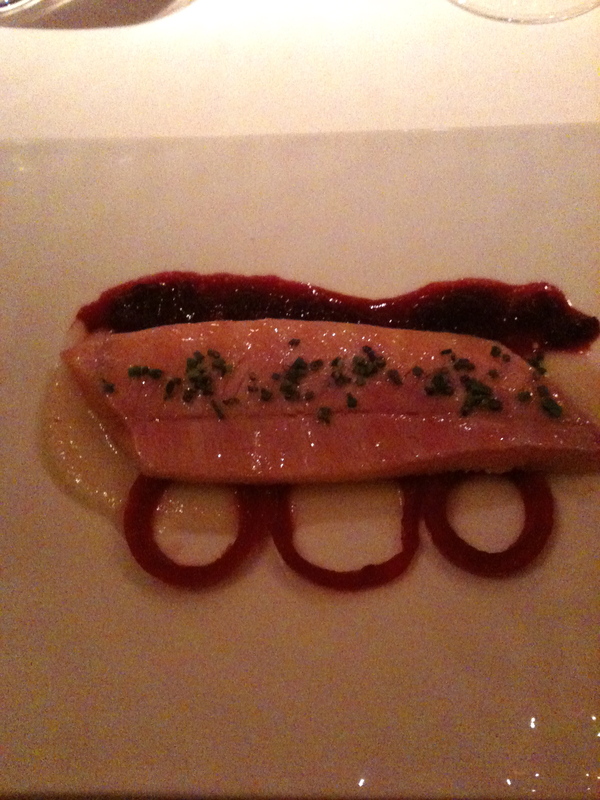 Smoked trout, at Gramercy Tavern. If a writer is a person who hates to write, is a blogger a person who hates to dash off unpolished, but timely posts? I’ve been awful about keeping this blog up to date, especially considering the fabulous dining (and other) adventures experienced in the last few months. Here in the early days of the new year, hindsight (and increasingly faulty memory) allow some details to fall away and provide crystalline vignettes of others: A fall visit to Blackberry Farm, with its new restaurant and dining room; a delicious chicken, lentil and sweet potato soup for our Sunday supper club, with a chocolate-and-vanilla buttercream with crushed candy cane birthday cake dessert; another great dinner at our favorite Knoxville-area restaurant, the Foothills Milling Co., in Maryville, and above all, incredible NYC meals, including a crab-and-coconut milk soup in the dining room of the Modern, at the Museum of Modern Art, overlooking the sculpture garden; a transcendant meal of Scandanavian delights at Aquavit, in a teak-appointed dining room that was as spare and clean as a sauna; fantastic people watching at Le Grenouille (full-length minks, expensive hair); “21” (old-school NYC families gathered around the bar fireplace); Ruby Foo’s (the Times Square parade of humanity just outside our window); Norma’s (the in-crowd digging in to hearty pancake-and-egg breakfasts at Le Parker Meridian). We also stumbled into a wonderfully old-fashioned family-run Japanese restaurant, Restaurant Nippon, which serves barley and other produce from its Canadian farm. We were thoroughly thrilled, delighted and exhausted — so much so that I can barely remember anything except a fantastic smoked trout at a late-night Gramercy Tavern dinner. Other great memories have nothing to do with food — the massive crowds, the store windows, the tree at Rockefeller Center, and laughing our heads off from the third row at Pee-Wee Herman’s Broadway show. Fortunately, we missed the blizzard that wreaked travel havoc for so many; still, that trip and the Christmas travels since then took so much out of us we’re still not up to speed — and we’re getting ready for our annual group trek to Asheville. So stay tuned for further reports!